Almost every auto manufacturer is working on electric car technology and here's our prediction of the top 3 electric cars in the market by 2011. 1. 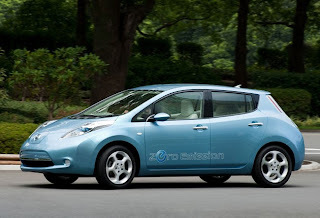 Nissan Leaf - It's coming to the US in 2010 with seating for 5 adults and a 100 mile range. Nissan seems to have skipped the hybrid technology development and concentrated on making the 100% electric Leaf a real world vehicle. Target price for the Leaf is around $30,000. 2. BYD e6 - Headed for the US in 2011 with seating for 5 adults and a 250 mile range. Never heard of BYD? Well, Warren Buffet invested $230 million in BYD and is making a bet that they will become the global leader in electric car production. Target price for the e6 is about $40,000. 3. Chevy Volt - Slated to launch in the US in 2010 with a range of 40 miles on the electric motor and another 260 miles on the 4-cylinder gas engine. Despite GM's bankruptcy, development on the Volt has continued and the car is still scheduled for a fall 2010 launch. Target price for the Volt is around $40,000. What about electric cars from Toyota, Tesla, and or even Honda? While Toyota is the king of hybrid cars via the Prius, the 100% electric version of the Prius has not been able to get more than a 10-20 mile range. Honda will follow its trend of waiting and observing first, then come out with its version a few years later that will be the best in the industry. Tesla, on the other hand, will target the high-end luxury market with the Model S. While Tesla will have success in its high-end niche market, it won't sell enough cars to make our top 3 list.